When it comes to electronic pet fencing, Puget Sound Pet Stop are like no other! Ready to Trade in your Invisible Fence®? Join the many others who are looking for a better electronic pet fence. Puget Sound Pet Stop offers Invisible Fence® Trade in specials: Our Pet Stop® electronic containment system is available for up to 70% discount when trading in a comparable model of Invisible Fence® transmitter, receiver or system. Needing just a service call? For any Invisible Fence® current user, we provide a one time 50% discount for our basic service fee. This can include a wire repair, system check, flag and train, etc. Pet Stop® The only Collar receiver on the market that is compatible with other brands of electronic pet fences. The Pet Stop® brand dog collar receiver can be programmed to work on most containment systems on the market. We can match AM or FM signals as needed. 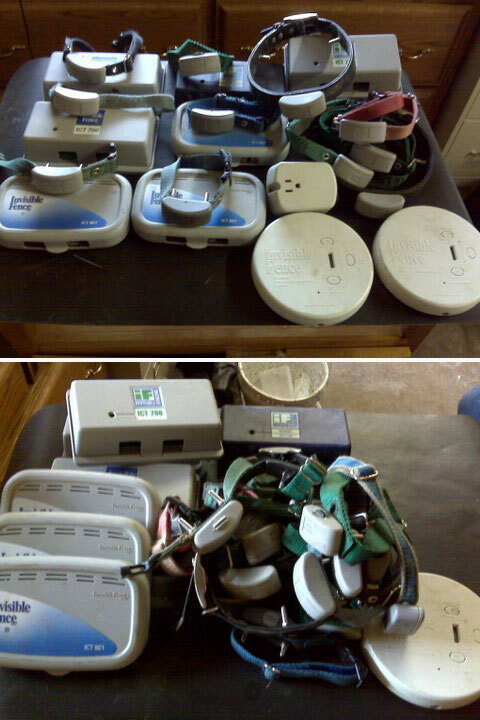 You can upgrade just one dog collar receiver or an entire outdoor pet fence system while using the existing wire. We offer a compatible replacement battery to fit any model Invisible Fence® R-21 or R-51 Computer Collar®. Call for special pricing on these high grade replacement batteries. ComfortContacts®: The comfort of soft rubber probes. SafetyStop™: Our products will shut off AND STAY OFF if your pet gets stuck in the zone. SmartReceiver®: Prevents false shocks better than any other brand. ZappAlert™ Wire Break warning in the event of damaged wire. I called both Invisible Fence and Puget Sound Pet Stop to meet with a representative. My meeting with Invisible fence was not productive and I did not feel at ease. In the first 5 minutes of my meeting with Pet Stop, I knew they were the ones for us! They were competitive, helpful, their collars were much more friendly and they were clearly looking out for our pets. How is Pet Stop different from other brands? No other systems have match the range of patented, customizable features offered by Pet Stop. We provide extensive hands-on training, which combined with Pet Stop’s pet fence systems, produce a 99.6% successful containment rating – Pet Stop has the highest sucessful containment rate in the industry. Puget Sound Pet Stop currently maintains a 100% Containment rate. Does Pet Stop offer an Indoor system? When you buy a Pet Stop system, we’re confident you’re purchasing hands-down the best containment system on the market. This belief in the effectiveness of our products makes it possible for us to offer a Lifetime Warranty on our Outdoor Transmitters and Receivers and a 24 month warranty on our Indoor transmitter. We simply offer you this; If you can find a more advanced pet fence system than Pet Stop, we’ll buy it for you. How much does a Pet Stop system cost? We charge a base price for our electronics which carry a Lifetime Warranty, then charge by the linear foot for installation. No two systems are alike, that is why we offer FREE consultations at highly competitive pricing to ensure you get exactly the right sytem for your space and your pets. In addition, we offer discounts for multiple pets on the system. Battery life depends on how frequently your pet challenges the system. In most cases, the battery lasts up to four to six months. Of course, when the battery runs low, Pet Stop’s Flash Alert.® lets you know when it’s time to change your battery. Pet Stop receivers are resistant to moisture, so it’s okay to keep it on while bathing your dog, or if they get wet in other ways such as during a sudden rainfall or an occational swim in the lake. Keep in mind that our receivers are only water resistant and not waterproof. If excessive exposure to water occurs, you should remove your pets receiver collar. – Dishwasher top rack safe.